The World Heritage Nomination of the Border Group (Tweed Volcano), Focal Peak Group and Main Range Group of national parks, in NSW Northern Rivers and Gold Coast QLD region of Australia. Gondwana Rainforests of Australia. Hint: use your right mouse button to open a new window for external sites (or back button to return here). The World Heritage Nomination of the Border Group (Tweed Volcano), Focal Peak Group and Main Range Group of national parks, in NSW and QLD, from its beginning in 1986 as the "Australian East Coast Temperate and Subtropical Rainforest Parks", through to the present day as "Gondwana Rainforests of Australia". The Tweed Volcano, Focal Peak and Main Range Groups are part of the Gondwana Rainforests of Australia World Heritage (WH) "property". This "property" is actually composed of a series of 8 distinct groupings of parks and reserves between Newcastle and Brisbane, united by the common story they tell of Australia's unique and evolving rainforests. Although each park has important values, it is the series as a whole which has outstanding universal value. The “Gondwana Rainforests of Australia” were originally placed on the World Heritage List in 1986, based on the 1985 nomination, with 16 rainforest areas in New South Wales (NSW) only, totalling 203, 500ha, and was called the "Australian East Coast Temperate and Subtropical Rainforest Parks". At this time the Border Group was known as the Tweed Volcano Group and did not include Springbrook, Lamington or Mt Barney nationals parks located in Queensland (QLD). In the Tweed Volcano Group, this included what the NSW NPWS called the "Caldera Parks and Reserves", and was comprised of the Border Ranges National Park, Limpinwood Nature Reserve, Mount Warning National Park, Nightcap National Park and Numinbah Nature Reserve. In 1994, this group was expanded to include Lamington National Park and Springbrook National Park in QLD, as had been originally recommended by the WH Committee in 1986. This also enabled the declaration of the “Lost World Wilderness” area, spanning the Border Ranges and Lamington national parks across the border of New South Wales (NSW) and Queensland (QLD). Other nearby national parks and flora reserves in NSW, and some state forests in QLD were also included. This group is now commonly referred to in UNESCO World Heritage literature as the “Shield Volcano Group” or “Border Group”. At the same time in 1994, in NSW, several flora reserves on the Richmond and Koreelah Ranges were added to the property. These included Dome Mountain, Murray Scrub, Cambridge Plateau and Mallanganee Flora Reserves. Together with Mt Barney National Park in QLD and the already listed Mt Nothofagus Flora Reserve in NSW, these reserves became the Focal Peak Group. Between 1995 and 1999, more than 50 new national parks were created in NSW. Many of these were created out of areas previously inside or adjoining, existing State Forests. All of the Focal Peak Group World Heritage listed flora reserves listed above, which were located in what were previously state forests, are now part of much larger national parks in NSW, including Richmond Range, Toonumbar, Tooloom, Koreelah, Mount Clunie and Mount Nothofagus National Parks. There are plans to review the World Heritage criteria for these parks to evaluate the suitability of including all of the parks areas, into a further revised and expanded Gondwana Rainforests properties listing. Comprised of national parks, state forests and flora reserves of approx. 23,641ha, the Main Range Group is located about 110km south-west of Brisbane, and extends from the Mistake Mountains in the north to the QLD state border in the south. While it is generally associated with the Great Dividing Range, it has has extensive volcanic origins, overlapping the Focal Peak group. The Main Range Group was listed in 1994, along with the Focal Peak Group, and extensions to Tweed Volcano Groups, above. The addition of the Queensland sites in 1994 brought a further 60,000ha of rainforest reserves into the property, and the property was then re-evaluated by the World Heritage Committee and was re-listed in the same year, under the name the “Central Eastern Rainforest Reserves of Australia” (CERRA). 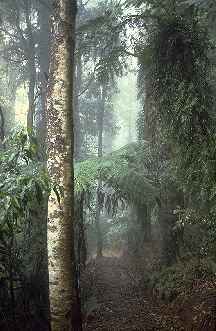 In June 2007, CERRA was officially renamed "Gondwana Rainforests of Australia" at the 31st session of the UNESCO World Heritage Committee meeting in New Zealand. Gondwana Rainforests of Australia Queensland and New South Wales, Australia, UNEP - WCMC Conservation Commons; PDF, January 1993, 4-1996, February 2008, May 2011, retreived May 2012. Master Plan for Queensland's Park System, QPWS, Environmental Protection Agency, 2001. Executive Officer of CERRA property, Grafton NSW, June 2001. Environment Australia, World Heritage Unit; brochure - World Heritage Rainforests, Central Eastern Rainforest Reserves, August 1997. NSW National Parks and Wildlife Service, Lismore; brochure - Toonumbar National Park, 1997. NSW National Parks and Wildlife Service; New South Wales Rainforests - the Nomination for the World Heritage List (revised 1987), Dr Paul Adam.